One week under saddle, this horse gained an incredible amount of confidence from Jose. JOSE ALEJOS returns to the Northwest March 31–April 14, 2019. Prices range from $280 to $2,500. This fantastic training seminar is filling up fast. Multiple divisions available. Prices include Board and turn-out, tack-up, cool-out, hacks, fabulous experience and confidence gained. Continued services following the training session of Young Horses may be arranged with Gwen Blake Training Team at Donida Farm. Jose Alejos, is an athlete, a horseman, mentor, and we are privileged that he is willing to share his experiences with us. 1) “Backing”: The backing of the unbroke horse. For horses never been started under saddle $1500 payable to Jose Alejos. Additional $500 board payable to Donida. 2) “Difficult horse”: (Rearing, bucking, bolting, bullying, bad stallion behavior, etc.) These horses may only need a few days of explanation/correction/evaluation or up to two weeks. Individually priced by Jose Alejos $2500 max. Daily stall or haul-ins payable to Donida @ $38.00 day. 4) “Individual rides”: available as well with personal consult. Individually priced by Jose Alejos and facility fee payable to Donida $38.00. Owners will learn how to deal with their individual horse by the end of this seminar. Riders will usually be on their own horse and going for group trail rides aboard their newly broke horse! Professionals expressed concern that they do not have time to start young horses as they have to focus their time on training and coaching, novice and advanced clientele. The inherent risk of starting young horses is widely acknowledged. The most proficient riders, trainers, or athletes are the ones who practice their skills every day. An Olympic competitor trains every day to become a champion in their sport, so should the horse trainer! Sport research concludes that to become one of the elite global athletes in any sport, it requires a minimum 10 000 hours of training and practice to breach the high-performance level, let alone be the champion. The presenters in this series are top athletes and coaches in the discipline of starting young horses. It is estimated they have well over 90 000 hours in their field to date. 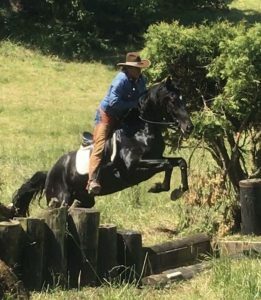 From Jose -“I travel the world starting young horses and addressing training problems in horses and their riders for virtually every discipline. I’ve been doing this since I was 10 years old when I first learned the principles of horsemanship from my grandfather. I call my method “rational horsemanship” because it is based on the natural interactions that occur among horses in a herd. Rational horsemanship takes advantage of a horse’s natural reaction to pressure and, even more importantly, its reaction to the precise timing of the release of pressure, so that the horse becomes increasingly responsive to the rider’s aids (seat, leg, and hand). Using this method, I sense when the horse is just on the verge of giving to pressure, at which point I reward the horse with the release. In just a few short weeks, my rational horsemanship approach can produce a responsive, balanced and happy young horse that a professional or good amateur can continue working with in their specific discipline. Ultimately, my method establishes a secure foundation for each young horse I work with, whether they are hunter, jumper, dressage, eventing, or western riding horses. A $1000 deposit payable to Jose Alejos will hold your spot followed by the balance due upon arrival. Special arrangements for Individual Difficult defined horses. All documents/releases/discriptions and information must be supplied with deposit. Initial deposit payable to: Jose Alejos.